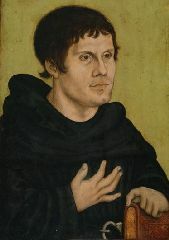 Workshop of Lucas Cranach the Elder, Portrait of Martin Luther as an Augustinian Monk, Oil on vellum, mounted on wood, post 1546, Germanisches Nationalmuseum, Nuremberg, Germany. Martin Luther was born in Eisleben, Germany. He received an M.A. in 1505 from the University of Erfurt. In 1507 he was ordained a priest, and began teaching at the University of Wittenberg. On a mission to Rome in 1510-11 he was appalled by the corruption he found there. Money was greatly needed at the time for the rebuilding of St. Peter's, and papal emissaries sought everywhere to raise funds by the sale of indulgences (a document stating that the Pope would forgive a specific sin of the bearer). The system was grossly abused, and Luther's indignation at the shameless traffic became irrepressible. As professor of biblical exegesis at Wittenberg (1512-46), he began to preach the doctrine of salvation by faith rather than works; and on October 31, 1517 drew up a list of ninety-five theses on indulgences denying that the pope had any right to forgive sins, and nailed them on the church door at Wittenberg. Pope Leo X summoned Luther to Rome in 1518 to answer for his theses. His university interfered, and ineffective negotiations were conducted on his behalf. In 1520 he published his famous Address to the Christian Nobility of the German Nation, followed by a treatise Concerning the Babylonian Captivity of the Church, which also attacked the doctrinal system of the Church of Rome. A papal bull was issued against him. He burned it before a multitude of doctors, students, and citizens in Wittenberg. He was excommunicated, and in 1521, Charles V, the Holy Roman Emperor, convened a council in the city of Worms to examine Luther's teachings. Luther was called to retract his teachings, but he refused. His books were ordered to be destroyed, and he was put under the ban of the Empire. On his return he was kidnapped (for his own protection) and taken to the Wartburg Fortress. During the year he spent there, he translated the Scriptures into German. In 1525 he rejected the Roman Catholic tradition of a celibate clergy and married Katherine von Bora, a nun who had resigned conventional life. In 1529, he engaged with the controversial question of transubstantiation in a conference at Marburg with other Protestant theologians; he maintained his view that Christ is present in the bread and wine of the Eucharist. In that same year he wrote the paraphrase of Psalm 46 that is still sung as "A Mighty Fortress Is Our God." I particularly enjoy this modern arrangement of that hymn. Luther died in Eisleben, and was buried at Wittenberg. Endowed with broad human sympathies, massive energy, manly and affectionate simplicity, and a rich, if sometimes coarse, humor, he was undoubtedly a spiritual genius. His intuitions of divine truth were bold, vivid, and penetrating, if not necessarily philosophical and comprehensive; and he possessed the power of kindling other souls with the fire of his own convictions.